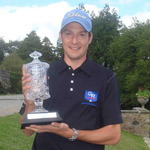 Caldwell still has a fighting chance of winning back the card he earned here last year but he certainly won’t forget his rookie European Tour season in a hurry and believes he will learn form his mistakes if he wins the right to play with the big boys again next season. “I am a wiser player but my game is better as well,” said Caldwell, who has had an eagle, 15 birdies as well as three double bogeys and a quadruple bogey eight this week. “I am putting better and my wedges are better as well. All round I am a better player really. I’d be a lot more confident if I got my card back. The cut off for the top 30 stood at six under par after three rounds with Kilkenny’s Gary Murphy just inside the mark after a mediocre level par 70 on the easier Tour Course. 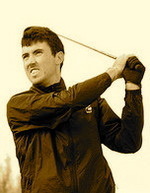 Niall KearneyRoyal Dublin’s Niall Kearney was frustrated by his lack of luck on the greens at the same venue as he posted a two under par 68 that leaves him two strokes outside the magic number but comfortably inside the cut line. Murphy has the experience to know that there is no need to panic just yet after a 70 saw him slip from tied seventh to tied 22nd. On a day when Spain’s Alejandro Cañizares scorched round the Tour Course in nine under par 61 to leap to tied fourth, Kearney was mildly frustrated by a two under par 68 that leaves him two shots outside crucial top-30 on four under heading to the tough Stadium Course today. “I missed loads of chances and it was playing easy out there,” Kearney said. “It could have been something in the mid-sixties quite easily. Slowly recovering his driving accuracy, Simon Thornton had a 69 on the Tour Course to sit one stroke outside the top 70 on one under but St Margaret's teaching professional John Kelly is playing for experience now after a 73 on the Stadium left him near the back of the field on nine over. Certain to miss the cut, 38-year old Kelly confessed that he must escape the pro-am grind in Ireland or he will be forced to shelve his dream of becoming a tour player. John Kelly (right) with Padraig Harrington and Michael McCumiskey of the PGA Irish RegionKelly said: "I am just totally lacking tournament practice. I can’t get stuff out of my head over the ball. It is not the way to be playing tour school. I am going to have to make up my mind after this: never to play in this again or play more competitive golf. "I played fantastic at first and second stage but when I am standing over the ball I am not a tournament player. I am a pro-am player, a teaching pro. If I want to play serious golf, I have to start playing more serious golf. So I have to decide. "I know my game is good enough. To shoot 73 today was embarrassing. I had eight or nine chances inside 12 feet and missed them all. If it had been Padraig Harrington, he would have turn that into a 64. "I am not a scoring player at the moment and it is probably the occasion. It is the final stage of tour school and I am one step away from my dream. There is a hell of a lot of pressure and it’s great to be here but at the end of the week I am going to look back and say, I wasn’t ready for it. 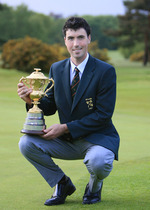 "Gary Murphy has been playing all year round and I have come from the Irish Region and giving heaps of golf lessons. I am not a tournament player. I can hit the ball as well as they do but I can’t score like a tournament player. I can do it in a pro-am but that’s not pressure. This is and I am not used to doing it. "This year I was ready. I had worked so hard with Padraig Harrington and the guys from TPI. I couldn’t have done any more. One piece of the jigsaw is missing and that’s competitive golf. I have done everything right but this is pressure. "Standing over the first tee shot on the first day you are more nervous than you have been in your life. That’s when you see what you have to improve on. No one can tell you, you need to know yourself. No matter how hard I try, I am missing that little link. I have to get it or go back to teaching full time. I don’t want to give up. I am too close. "I hit it fantastic today so that’s the encouraging thing. Unless I play more competitive golf and stop playing pro-ams and the Irish Region of the PGA, which has its merits, doesn’t prepare you for tour school. "I am not going to shoot 59 and make the cut. So I have to move up as much as I can tomorrow because it will give me a better chance of playing more events next year. This tests everything. Pro-ams don’t test anything." 223 J Kelly 72, 78, 73.